A spectacular architectural home with angles aplenty proved a great inspiration to this designer. The show-stopping island is a geometric masterpiece: with clever compound cuts clad in a dramatic Pietra Grey stone, the angular façade is simply striking. Combined with well thought out space planning and fabulous finishes, the kitchen is a stand-out winner. 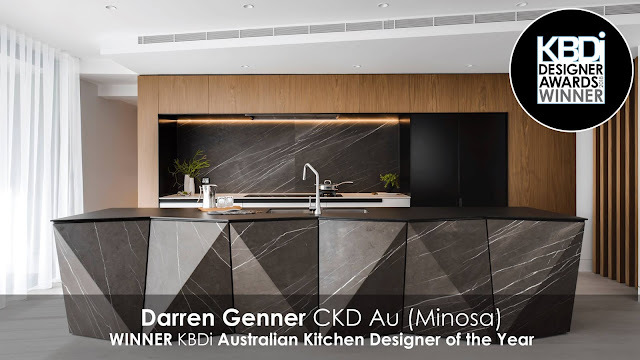 Flawless documentation, a daring resolution and the exceptional detailing of a challenging space earned this designer the esteemed title of KBDi Australian Kitchen Designer of the Year. The judges loved the designer’s unique response to a complex space, and were wowed by the geometric mastery of the island benchtop. 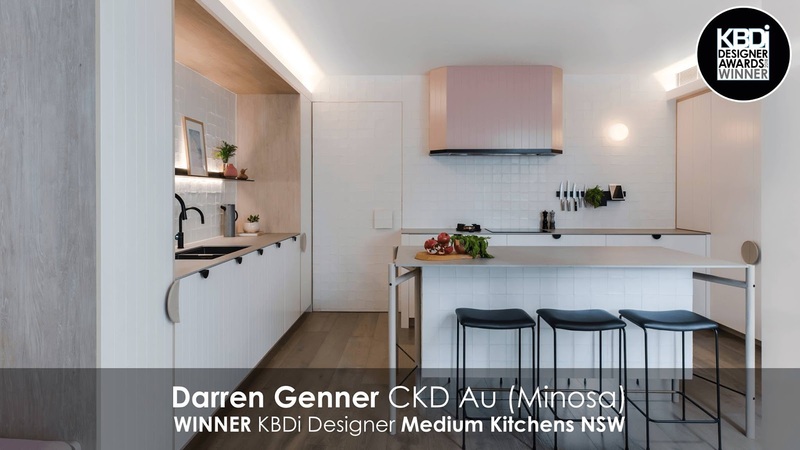 They admired the well thought out and practical planning, and balanced application of colour and texture in an overall stand-out kitchen design. 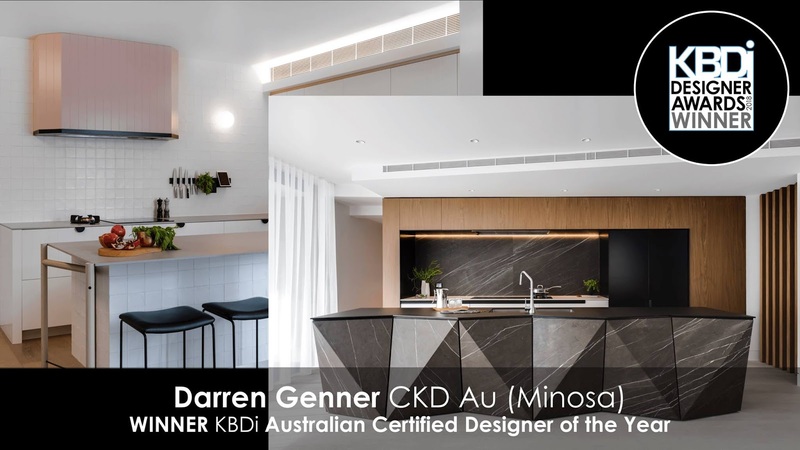 Two outstanding kitchen submissions, both with stunning design resolutions, exceptional plans and specifications and great confidence in application earned this designer the coveted title of KBDi Australian Certified Designer of the Year. The judging panel were awed by the standard of work submitted, and applauded the designer for his exceptional design talent and proficiency in documentation. Lime-washed oak, warm white cabinetry and white matt handmade tiles combine to create a lovely light and airy feel to this perfectly planned kitchen. The designer expertly finished the space with just the right amount of a luscious lilac-hinted pink. The hue lifts the scheme and creates a stunning focal point in this very refined and well-designed kitchen. 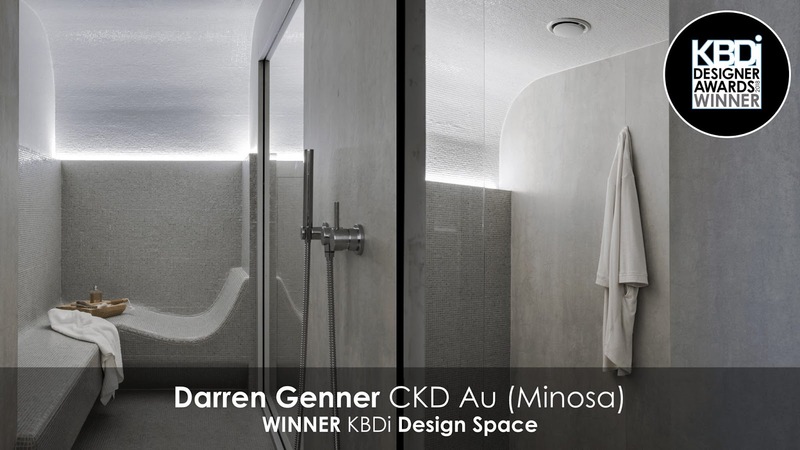 An underground space filled with dirt, pipes, cables and a watertank was ingeniously converted to a luxurious steam room in this Bronte Beach home. The designer effectively overcame the numerous challenges that arose, and successfully met the clients’ complex brief. The finest of finishes, layered lighting and alluring organic forms add opulance and elegance to this stunning steam retreat.